Apps on the Heero network come jam packed with all kinds of awesome features. Don’t believe us? Have a look at the list below to see what you’ll be able to do and how you can engage your fans. From your dedicated admin area add articles to your App and select whether to make that content a News item, Interview or a Guide. Assign a title, select what game or squad it relates to and include a lead image to display in your App. List all your player streams from Twitch and enable your fans to watch live streams directly from the App contributing to your “hours watched” totals. Got loads of great videos on your YouTube channel? Add the YouTube URLs into your admin area and have them displayed in your App so your fans can watch all your YouTube goodness wherever they are. List the games your team play and create player profiles complete with profile photos, descriptions and peripherals details. Create competitions and giveaways for your fans – all they have to do is complete a simple form to enter and you can track all the submissions through your admin area. If your fans login to the App with Facebook or Twitter they will be able to see which of their Facebook Friends or Twitter Followers are also using an App on the Heero network. When you create squads and list the games you play inside the CMS the App will magically add them to a filter. 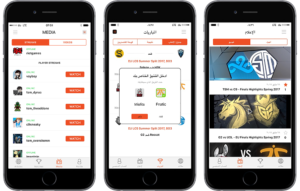 Fans can then personalise their experience by choosing which games and content they want to see inside the App. Manage league or tournament fixtures for fantasy predictions. Your fans can then tap on a fixture to submit a prediction of who they think will win. This all gets tracked by Heero with a correct prediction earning a fan 10 points. As fans make predictions and earn points they will get listed in a leaderboard. It is up to you how you reward them. We’ll also provide you with access to see how your fans are using your App, how often they use it and what features they use the most. You also get the ability to send Push Notifications to your fans to alert them to new content you’ve added. Written content, videos and competitions you add to the App can be marked as “Exclusive” enabling you to offer exclusive subscription content to your fans. Fans subscribe for a small fee to access that content with both monthly and annual subscriptions available.